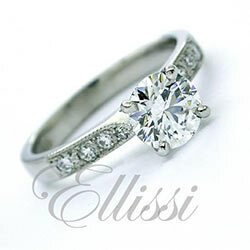 Full diamond set bands are diamond rings with gemstone content set right around the ring. It is a very effective look, however it should be noted that a number of major issues need to be considered before the decision to have this option is made. Diamond Set Bands: Functionality and practicality. Once you have dealt with fact that setting a ring with diamonds right around is going to cost about double that just the top half . You have to think about how this ring will work on an everyday basis. So Apart from the cost, the main other issues are, the comfort of the ring and the functionality and practicality. Fully diamond set bands have no top or bottom generally, as they are in most cases uniform all around. It is a fact that a ring band often takes quite a bit of punishment from grabbing hold of things. When it is settings with diamonds in this position, they too receive a greater amount of wear and tear. As the rotates, the settings on the inside of the hand become the ones on top of the finger and vice verser. As a result, all the diamonds and claws take a turn in the firing line of potential damage. Because of this abrasion all the settings may become slightly knocked around. The result being a far greater likelihood that the diamond settings and diamonds may be damaged, become loose or dislodged and drop out. This can happen regardless of the quality of workmanship, especially if the person wearing the ring carries out activities are not conducive to wearing diamond rings of this type. It would be a really good idea to make sure this sort of ring is covered by insurance, just in case. A diamond band with diamonds all around, should be considered a bit more fragile than a standard sort of ring and so additional care must be taken with them. Making a selection in this area will mean that your ring will require a little greater care and attention. It should be checked around every 18 months or so by a jeweller. This is simply to make sure all diamonds are secure in their settings and keep an eye on how the ring is being treated. It should also be said that adjusting the finger size of a fully set band is not often possible. The ring may need to be re-made to achieve the new size. If the above points are understood and more than the usual care is taken, these rings are a great looking option, that will give years of pleasure.